Depending on the type of liquid that you are dealing with, turning the liquid into solid can have various advantages, such as, easier to handle, cheaper and safer to transport, and better management of material. As a solid, the material may also be used for other purposes, such as clean fill material or agricultural land applications. 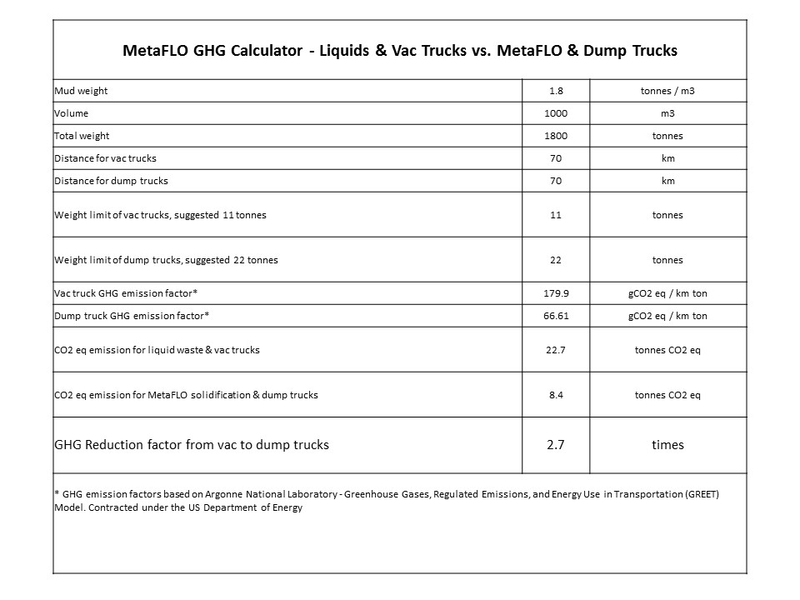 Others (particularly those in jurisdictions where greenhouse gas reduction impacts carbon credits) are enjoying the reduced trucking that comes from putting MetaFLO operations on their sites. Our solidification methods use extremely low dosages of reagent to achieve regulatory solids criteria – often less than 1% wt/wt. The low dosage adds less weight to the source waste than what is lost through natural evaporation after treatment resulting in a net reduction in total waste. Dump trucks can now be utilized to transport the solidified material to the appropriate disposal site far more efficiently than relying on vacuum trucks to transport liquids to treatment facilities. 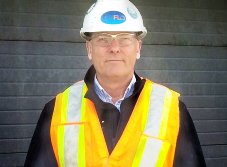 Additionally, liquid waste receiving sites are more scarce in most jurisdictions resulting in longer drives and greater cost associated with turn-around times. The table below illustrates how more trucks and greater drive times cause significant and unnecessary additional carbon emissions. Municipal lagoons require very little hands-on maintenance. In many instances, the adage “out of sight, out of mind” fits lagoon operations. That is until issues arise, such as meeting new regulations or a loss of capacity. When it comes to capacity issues, sludge accumulation is often ignored, so it is not uncommon to anticipate sludge accumulation of 200 m3 per year. 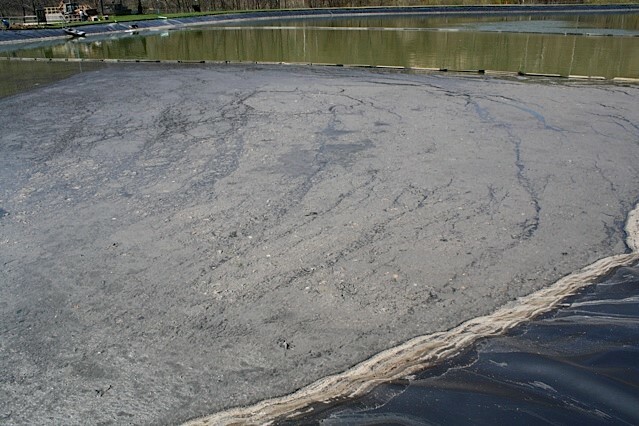 Over time, accumulated sludge can reduce the hydraulic capacity of the lagoon. 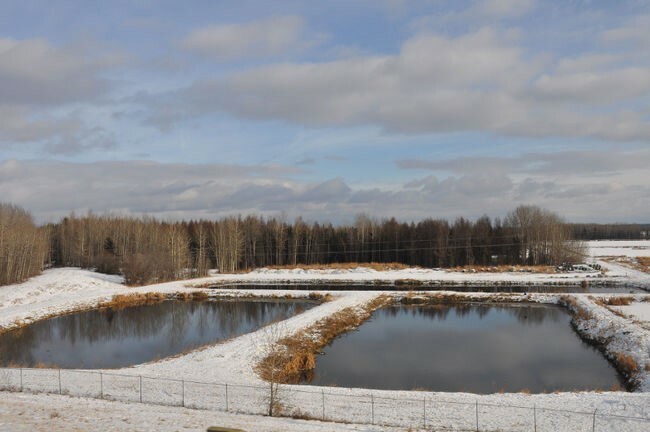 Treating that sludge with the MetaFLO solidification process, and removing it to a landfill, will increase the lifespan of the lagoon in a cost-effective and environmental friendly manner. The naturally occurring sediment in this storm water management pond had exceeded the pond’s designed capacity. 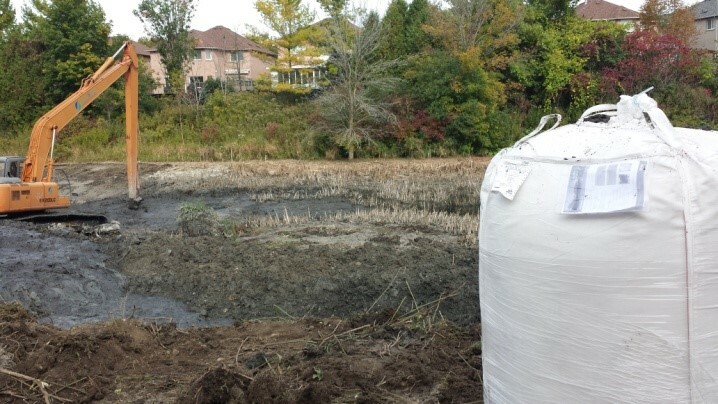 The regional conservation authority planned the remediation of this pond to involve the removal of this sediment. The volume of sediment to be removed was very large, thus the cost to transport and dispose of this wet muck would be very costly. 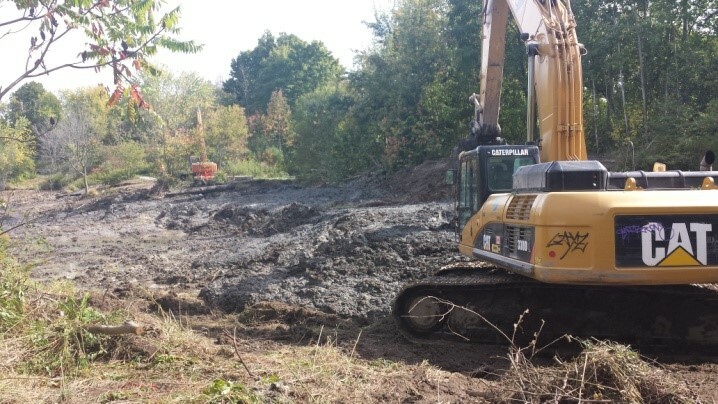 It was determined that on site solidification would be a better option, allowing for the removal of this waste stream as a solid, using a MetaFLO reagent it was possible to treat the sediment and meet the required solids criteria for transportation. Additionally, the MF006 proprietary formula is environmentally friendly adding no contaminants / impurities which would diminish the solidified waste’s status for beneficial reuse options.